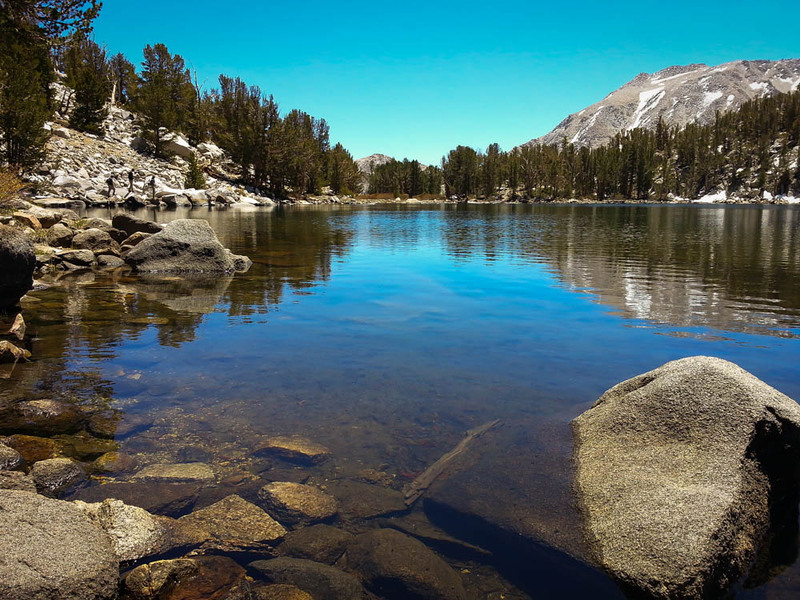 For our first backpacking trip of the season, we decided last minute on the North Fork of Big Pine Creek - a beautiful basin of glacier-fed lakes that I have been eagerly waiting to do. 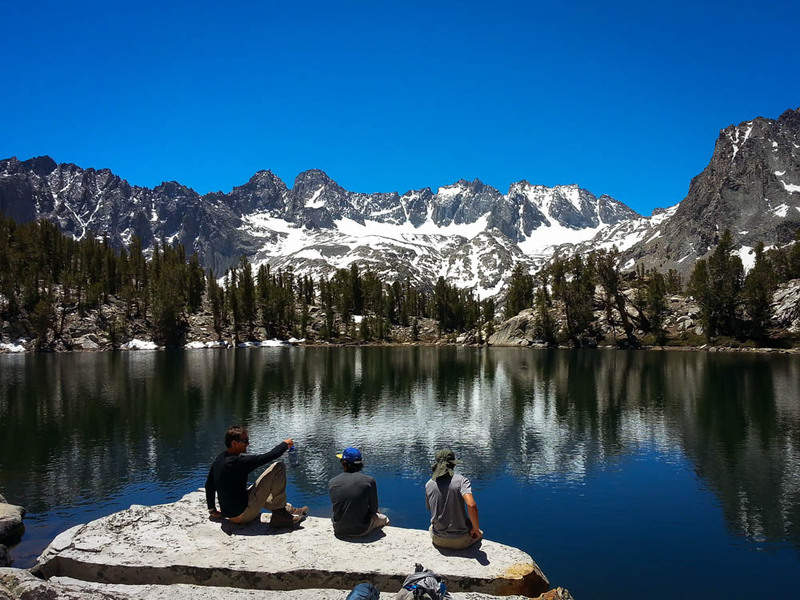 Once we got there, I could see why this was a popular destination - the impressive snow-capped peaks towering above all 9 beautiful lakes, great fishing, and ease of access make the North Fork the ideal Sierra hike. We didn't leave San Diego until 8:00PM, making the drive up the 395 a dark and exhausting one. 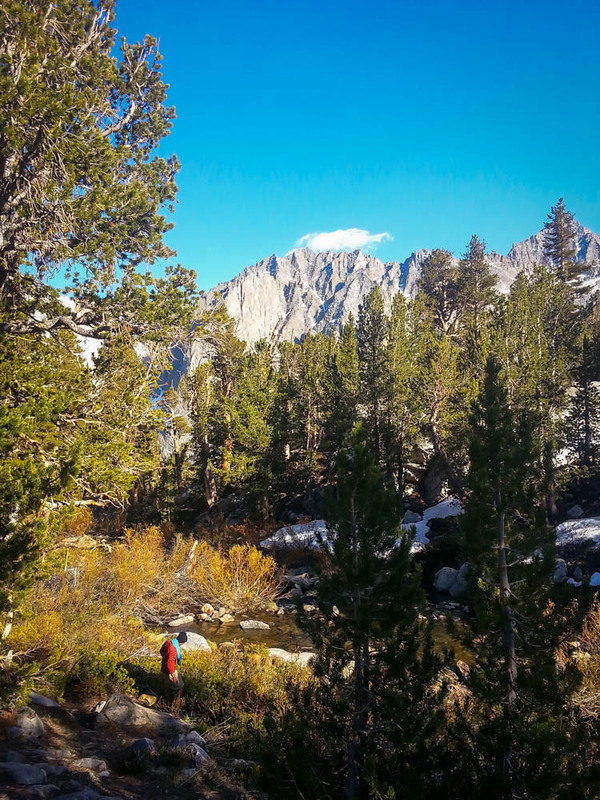 We called the Wilderness Office in Lone Pine a couple days before the trip to arrange for night pick up at the Eastern Sierra Interagency Visitor Center in Lone Pine. 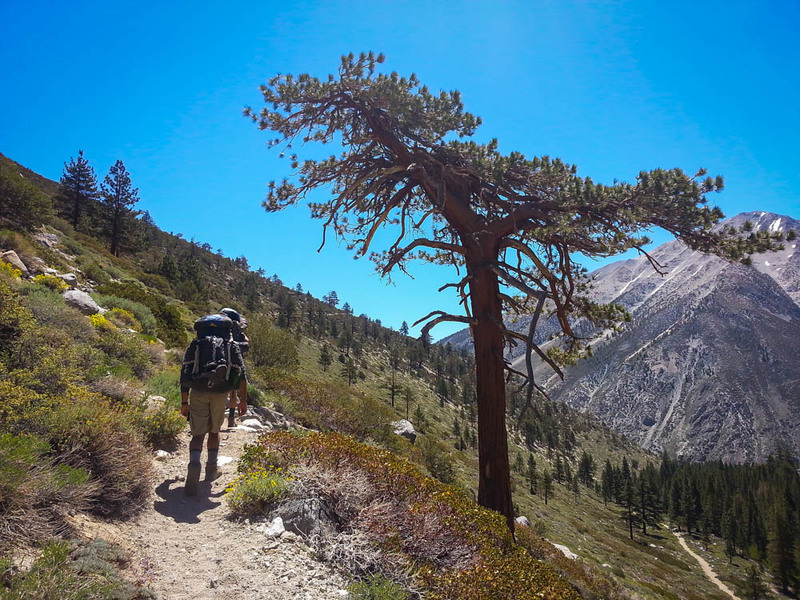 After we found our permit in the locked night box, we continued to Big Pine. We initially missed the turnoff the 395 since it almost seems like a residential street, but if you stick with it, the road continues on to wind up over the mountain. 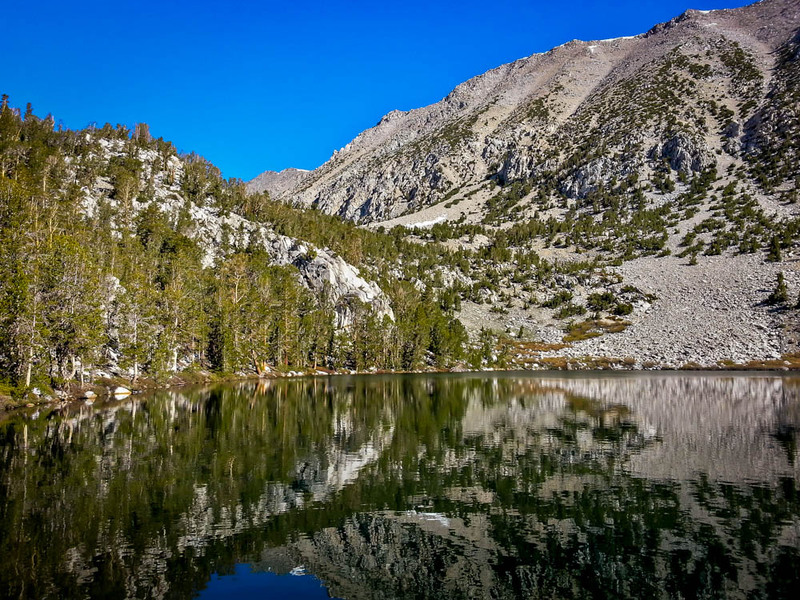 We drove into Big Pine Creek Campground in the dark and quickly set up camp at 2:00AM so we could get some sleep before the hike in the next day. As we packed up in the morning, we realized our bread and tortillas for lunch were moldy! Thankfully the small store was open at the lodge next to the campground, and the clerk was kind enough to sell us some tortillas and saltines. 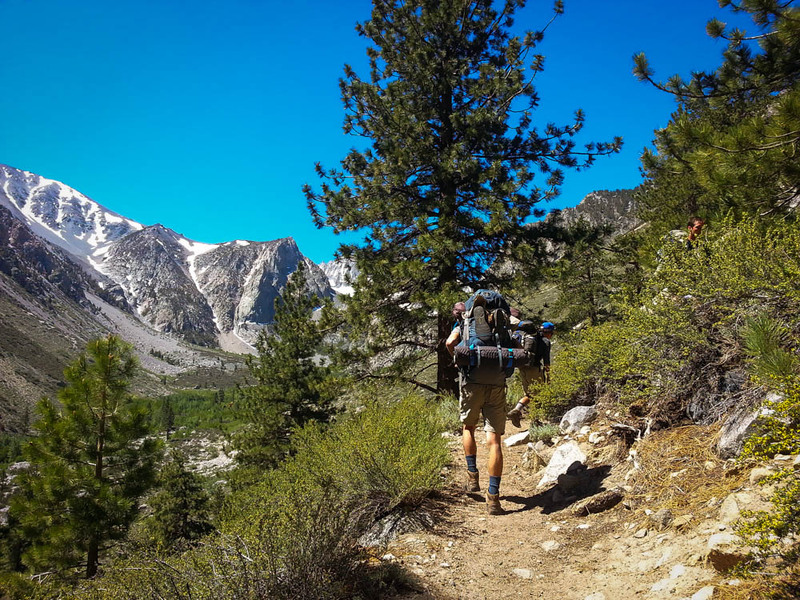 Since there is no overnight parking near the true TH (7700 feet), we dropped off our packs at the TH and drove back down the road to park at the overnight parking lot about 1 mile away. They have bear boxes here, and the hike back to the TH along the creek is partially shaded. We finally hit the trail at 10:30AM. After a switchback once we passed several cabins, we crossed First Falls - a series of cascades. 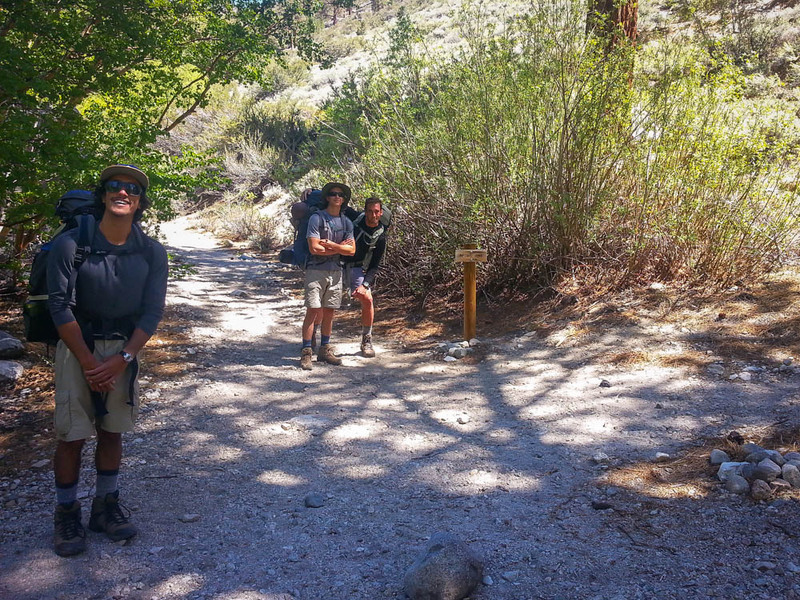 After turning right onto the North Fork trail, the trail climbed up some sandy switchbacks under some partial shade. 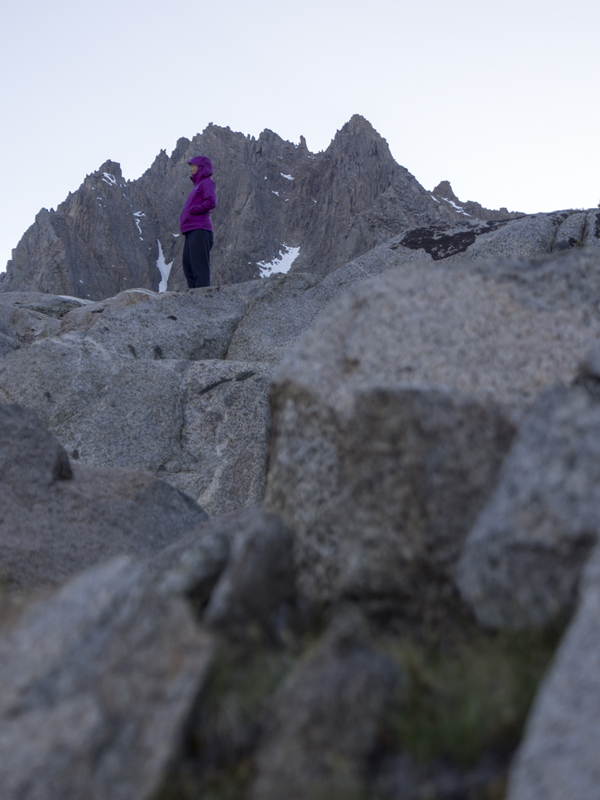 We were still unacclimated to the high altitude, and found ourselves easily out of breat. We had 2100' to climb over 4.5 miles to 1st Lake. After the junction, the trail is very exposed, sandy, and an uphill climb to the top of 2nd falls. We soon reached a stone cabin built in the 1920s. When we reached the start of the loop at 9969' we opted for Lakes 1-7 first because they were closer and we wanted to stop to have lunch soon. 1st Lake was difficult to see from the trail, and we were really hungry so we continued on to 2nd Lake. 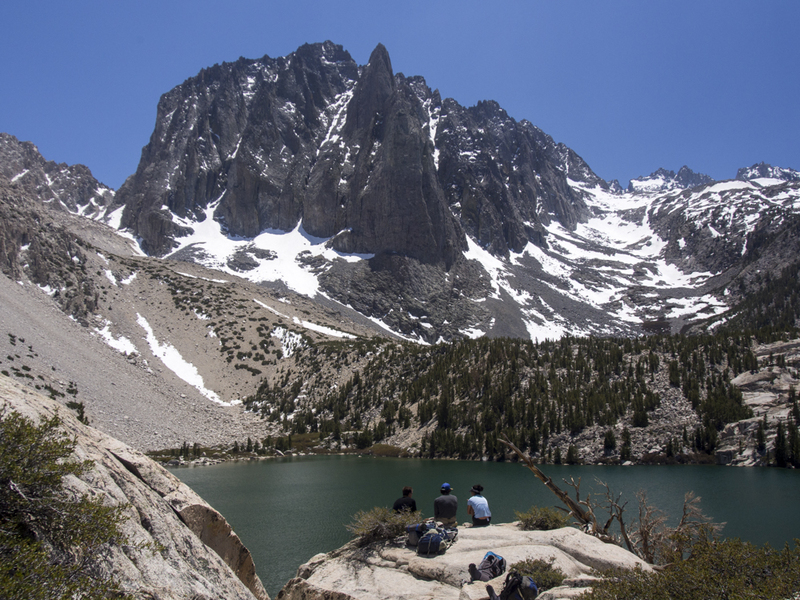 When we got there, the view was so picturesque with Temple Crag towering above the lake. We found a flat rock on the edge of a cliff looking over the entire lake to have lunch. As we continued on to 3rd Lake, the trail passed through lush gardens and rock walls dripping water from cracks. 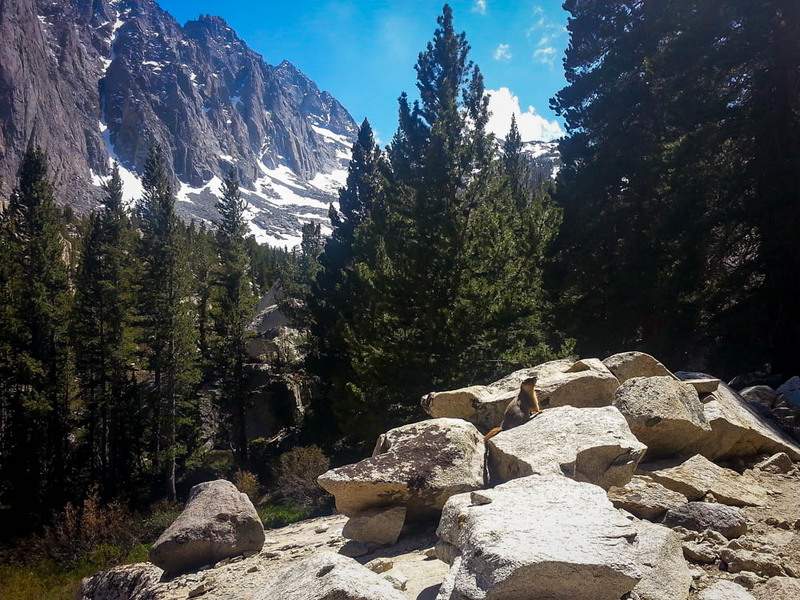 We abruptly stopped when we spotted a marmot perched on a rock right next to the trail, and we watched him for several minutes. 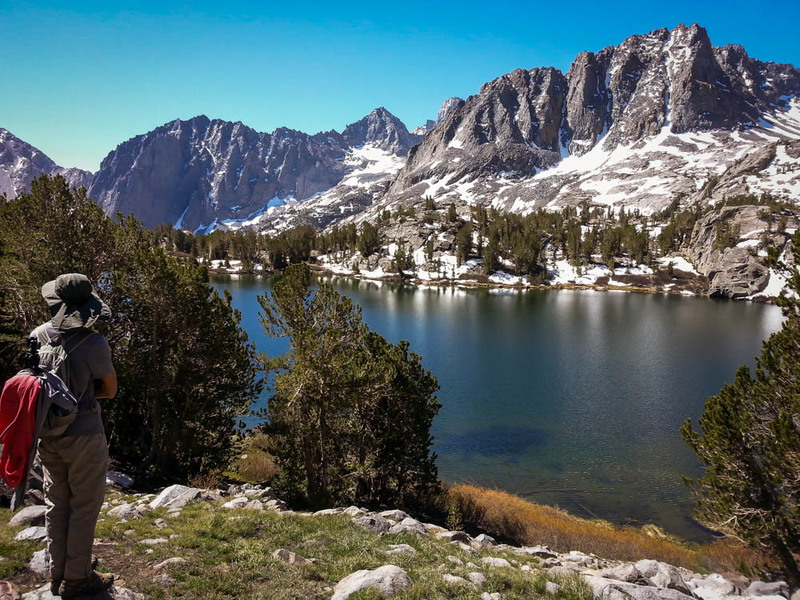 At around 5.2 miles, we reached 3rd Lake (10,271'), one of the best views we would get of Temple Crag. 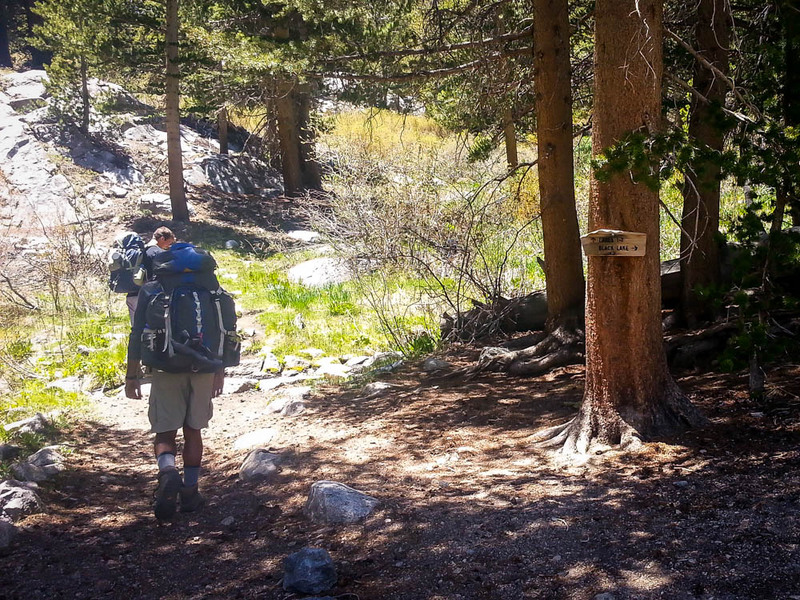 After lots of switchbacks, we reached the junction for the Glacier Trail at 10,641'. We started passing patches of snow. Blake decided to cool the seat of his pants. As we passed 4th Lake, we saw it was a little more marshy and didn't have as great views of the Palisades. 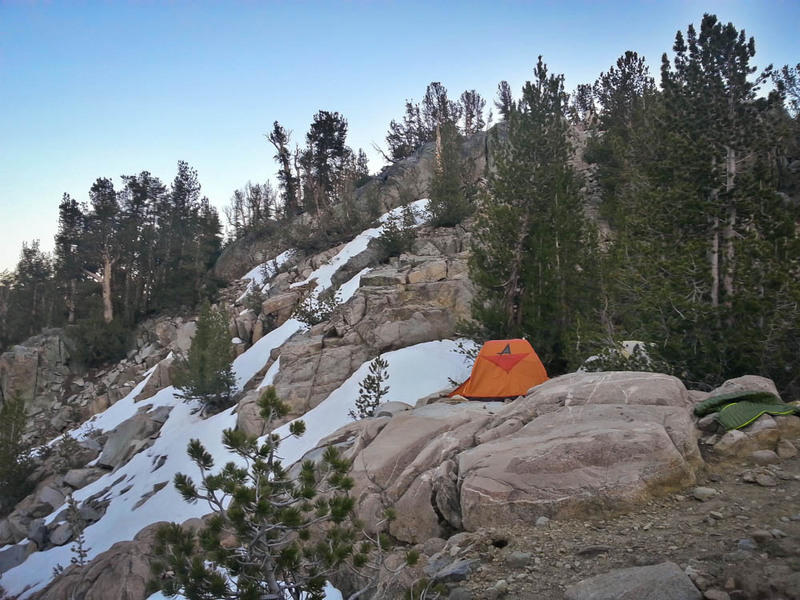 So we climbed over the saddle to 5th Lake and found a campsite where we were able to squeeze 2 tents in. 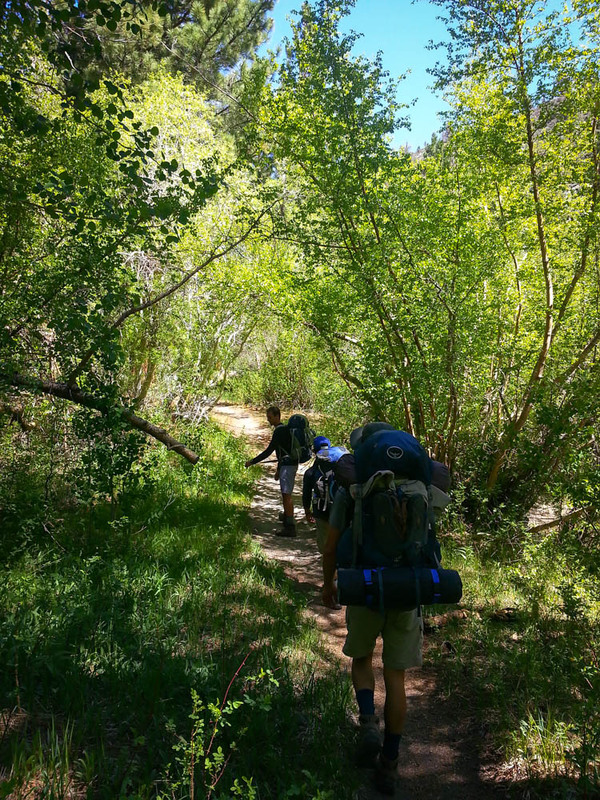 We were hiking at a really slow pace, and we didn't make it to camp until 4:30PM. Relieved to have finally made it to our destination, we dropped our packs, went to pump water, and started making dinner. It was a frigid night, and we barely made it past sunset due to the chilly wind. We were exhausted anyway, so we crawled into our warm tents early. Sunrise was beautiful the next morning, lighting up the mountains in an orange glow. 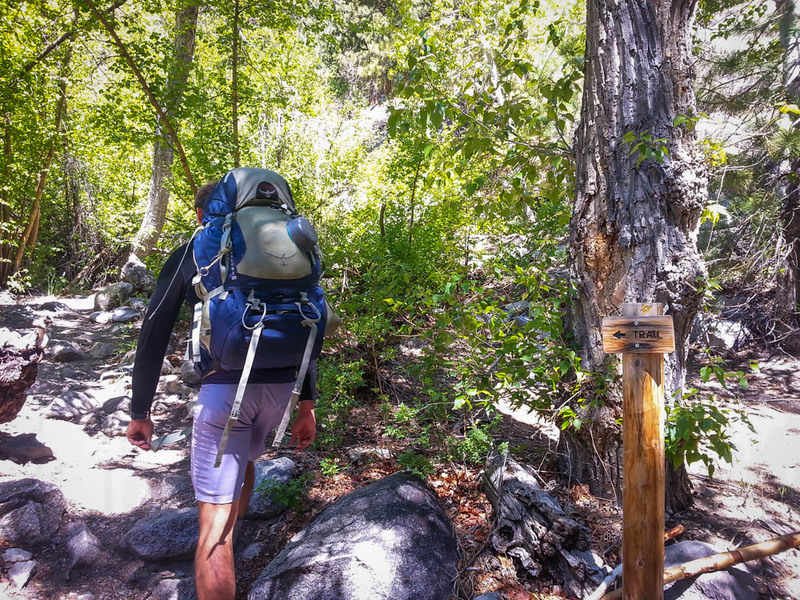 After a hot breakfast with coffee, it felt great to hit the trail with just a daypack on. 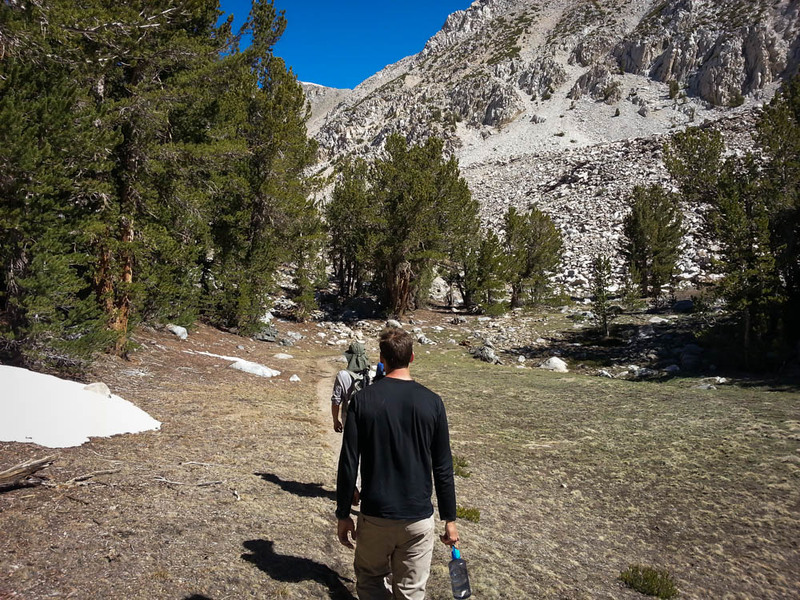 It was a short uphill climb, and we passed several snow patches that we could easily walk around. We were expecting the higher lakes to be semi-frozen, but none of the lakes had a trace of ice. When we reached 6th Lake, we saw some of the first groups of people of the trip. They were fly fishing at 6th Lake, and had caught lots of fish on their trip so far. 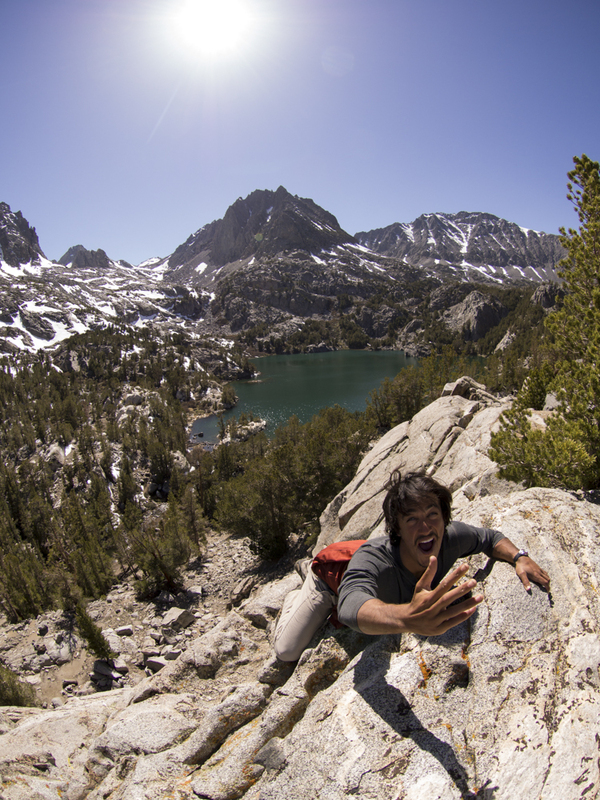 We lost the trail and cross-country over lots of boulders up to 7th Lake. From our perch here, we could see 6th and 7th Lake at once. 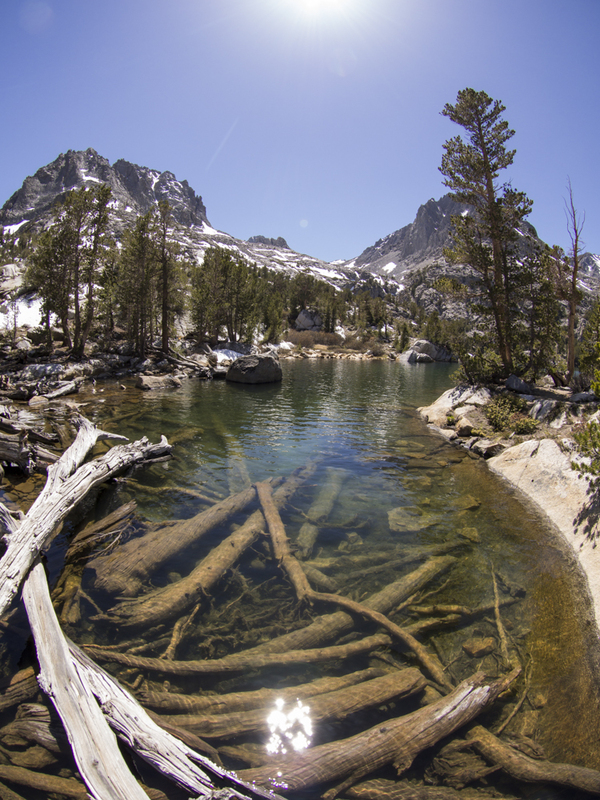 As we hiked back on the trail we came from, we turned left at the first un-named junction to head up to Summit Lake. 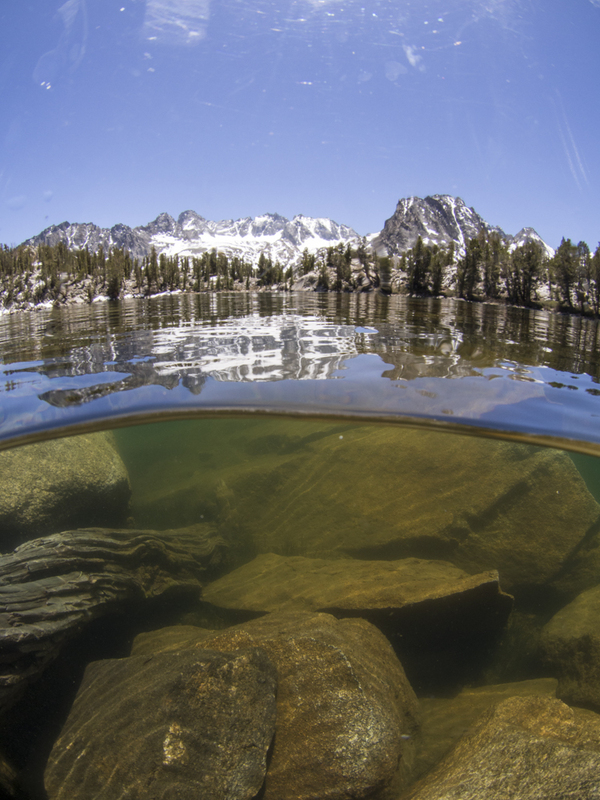 Kyle's split shot image.. he waited for a trout to come by for so long! The hike back to our camp site was quick and all downhill. 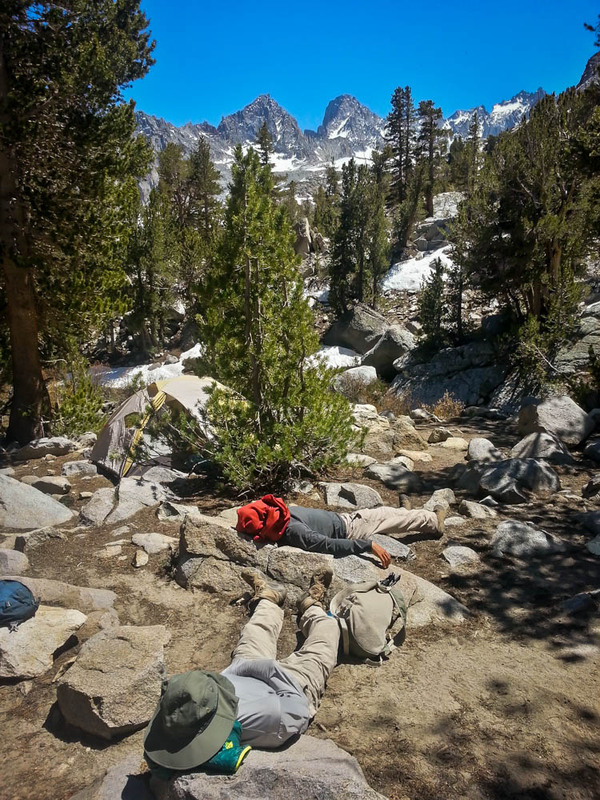 Gabe and Blake took a short nap while Kyle and I explored around 5th Lake. 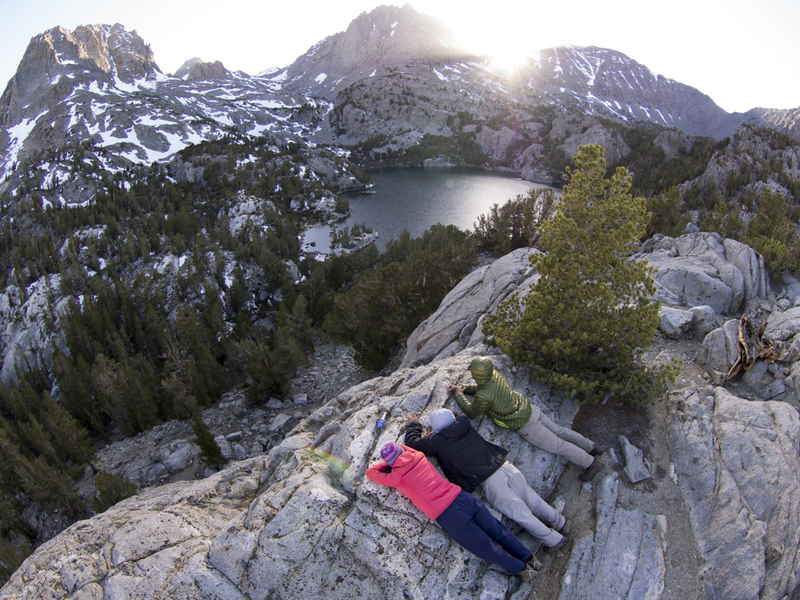 After we moved our campsite, we climbed up the rocky peak adjacent to our site to watch the sunset. The one group picture from the trip! Since we were much more protected from the wind and warmer than last night, we stayed up long enough to see the stars come out. The moon was very bright, but seeing all of the stars that are out there is one of my favorite thing about backpacking. The next morning we had to lay out our tents to let them dry while we made breakfast and packed up. 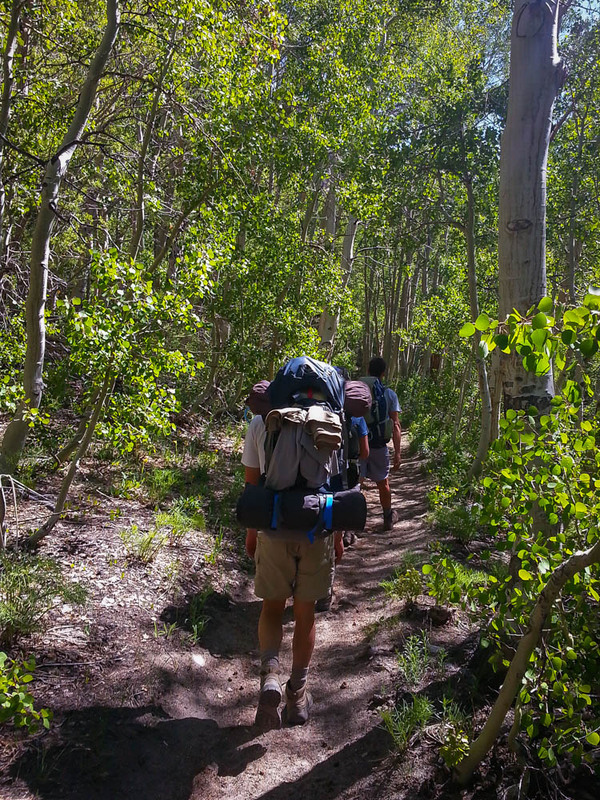 Our packs were so light, and we were excited knowing most of the hike was downhill. We quickly reached Black Lake and stopped to pump water. 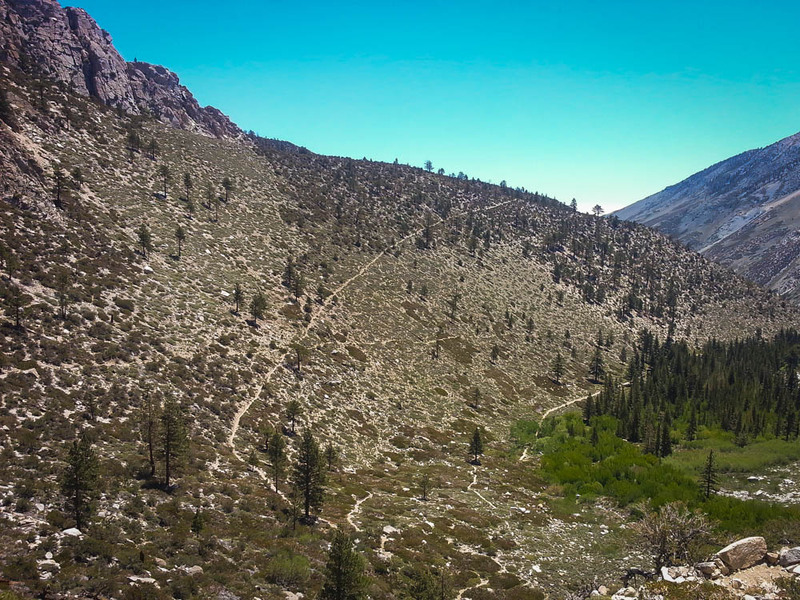 The switchbacks descending from Black Lake to the beginning of the loop were very steep and exposed. 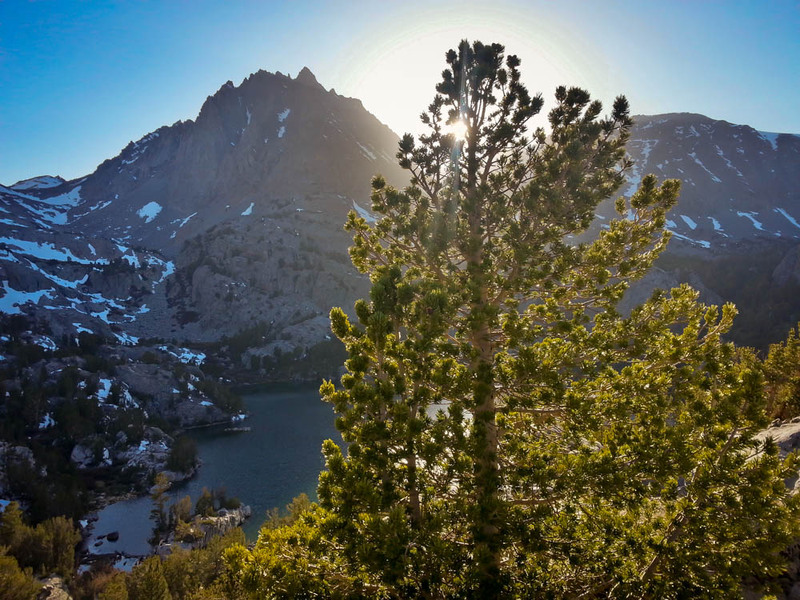 We were glad we did the loop clockwise, as we saw views of the lakes below Temple Crag while descending the switchbacks. 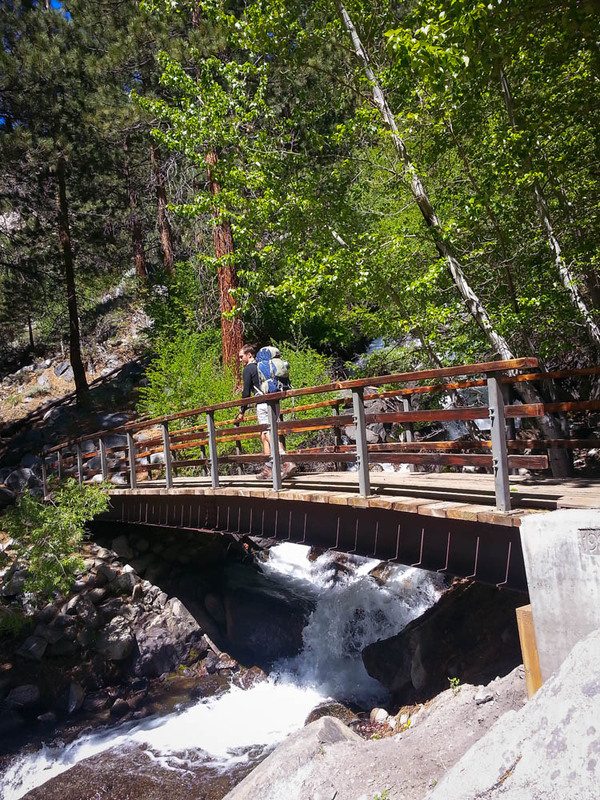 We reached the end of the trail by noon, and the boys went to go fetch the car. We saw the other group of backpackers return, and they were happy they didn't receive a parking ticket since they figured it was early season and alright to park at the TH. 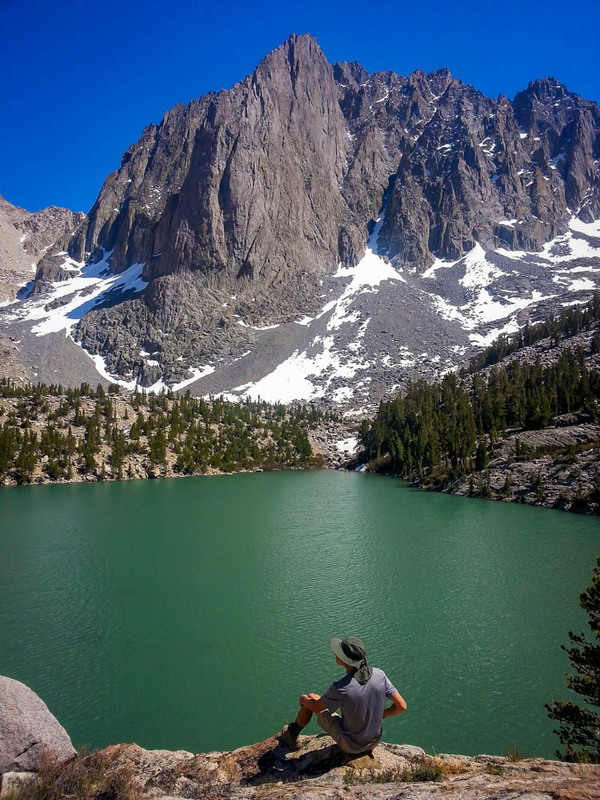 This trip has definitely spoiled me, as we didn't have any of the crowds and mosquitoes typically encountered on any peak summer weekend. 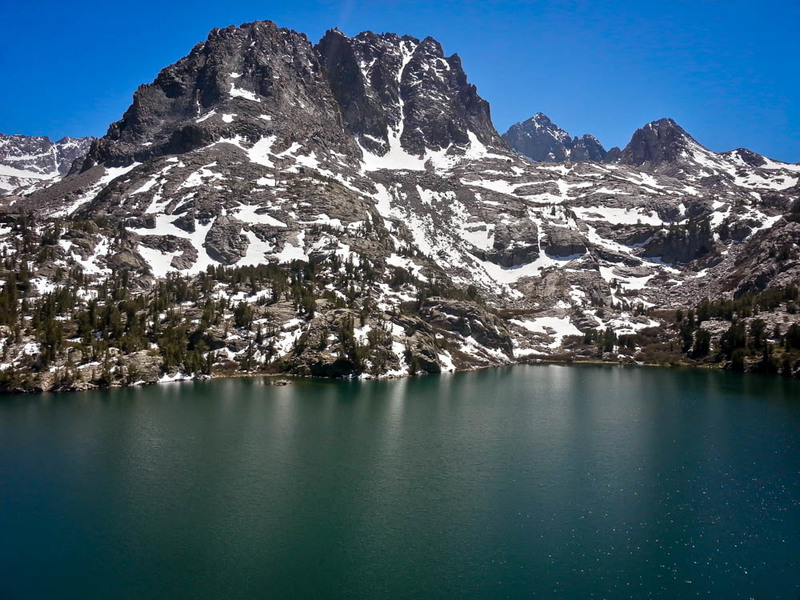 Excited to see the lakes take on their true turquoise color later in the summer. 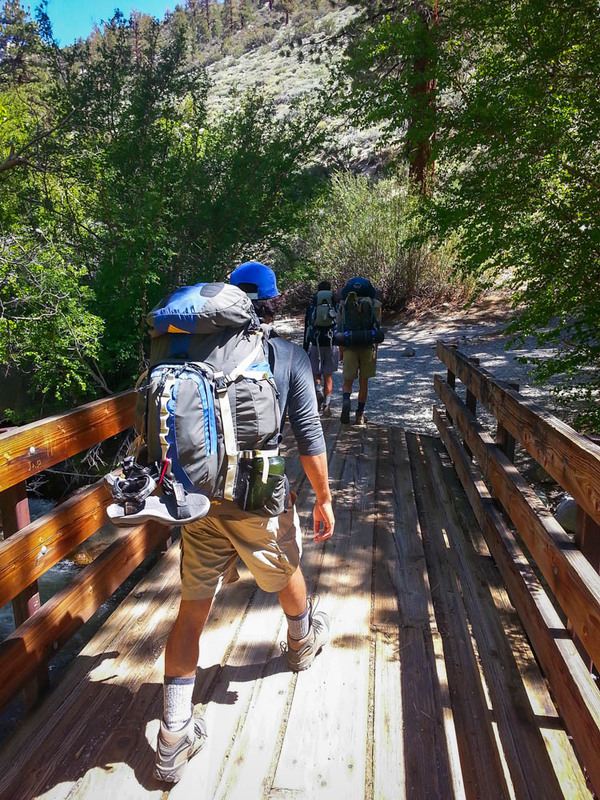 Click here to read about my summer experience on this trail.